After a brief summer hiatus, Speak Easy in Manchester is back and classier than ever. Always free, always easy, Speak Easy takes place on the first Thursday of every month at Stretford’s finest and most secretive bar: The Sip Club. If you can find us, whisper the password and we’ll let you in for a night of eclectic poetry, prose and creative non-fiction. Expect a mix of open mic veterans and spoken word rookies all hosted by Manchester word-darling David Hartley. 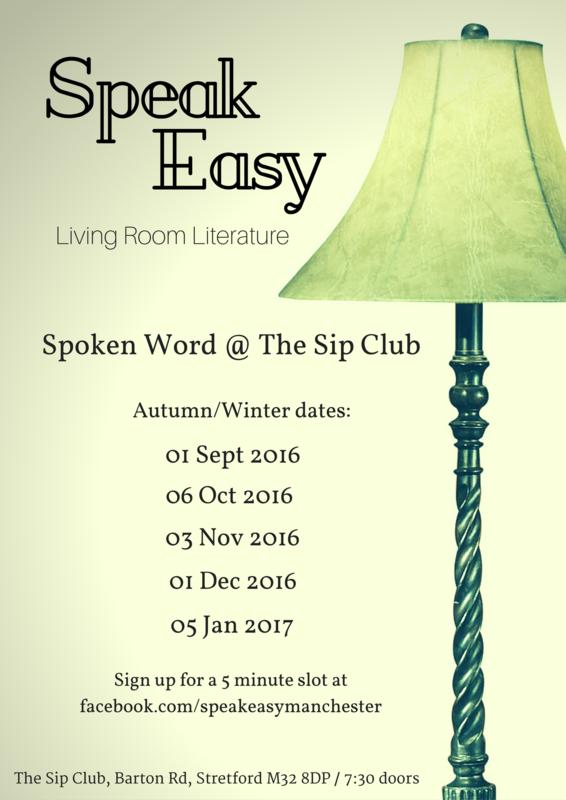 The Speak Easy Autumn/Winter dates are on Sept 1st, Oct 6th, Nov 3rd, Dec 1st & Jan 5th, and if you’re itching to read your words to the Stretford massive then sign up by sending us a message on the Speak Easy Facebook page. We’re especially keen to find spoken word first-timers: no pressure, no heckling and no expectations. Just you, your words and five minutes of safe and supportive stage time.